Whether they are friends, family, or a professional service, have things ready when the packers arrive. This includes ample boxes and packing materials if you are providing them. Set aside or label anything you do not want packed. Waiting until the last minute to sort slows the process. Save time, money and anxiety by being prepared. Set aside on a bed or in a box anything you need to have overnight during your move such as toiletries, medicine, clothing, the laptop, cell phone charging cords, etc. 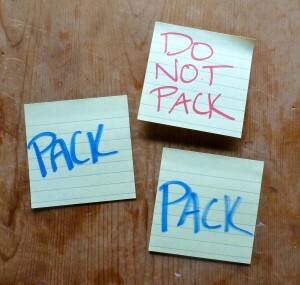 If you want the packers to focus on certain areas of the house or a room, use sticky notes to designate them. Adhere with an extra piece of scotch tape to prevent the notes from falling. If a tabletop and/or the items being packed on it are fragile, lay a sheet or thin blanket down on the surface for protection. Set aside high-value items such as artwork or collections, and inform the packers of them upon arrival so that they take extra care. Moving companies usually do not transport plants, flammables and hazardous liquids or materials of any kind. Be sure to inquire with your movers about what they will not transport so that you don’t have the packers pack it. The packers can tape these easy to read labels onto your moving boxes…a great way to help you and your movers see what boxes go where. Print only the pages you need on the back of scratch paper. You can always just have them use good old fashion marker labeling, too. Use these nifty room signs to put on doors and walls at the new house and help your movers get boxes to the correct rooms. Highly recommended. Have the movers place boxes according to the pre-printed room signs. Leave pathways, table and countertops clear so that you or your unpackers may use them to safely work. Flatten and stack used wrap paper, then roll together about 25 pieces at a time and stand upright in a large box. Several stored this way takes up less space and are easier to carry than scrunched paper stuffed into garbage bags. If you are passing these materials onto another person to reuse, she will appreciate it.